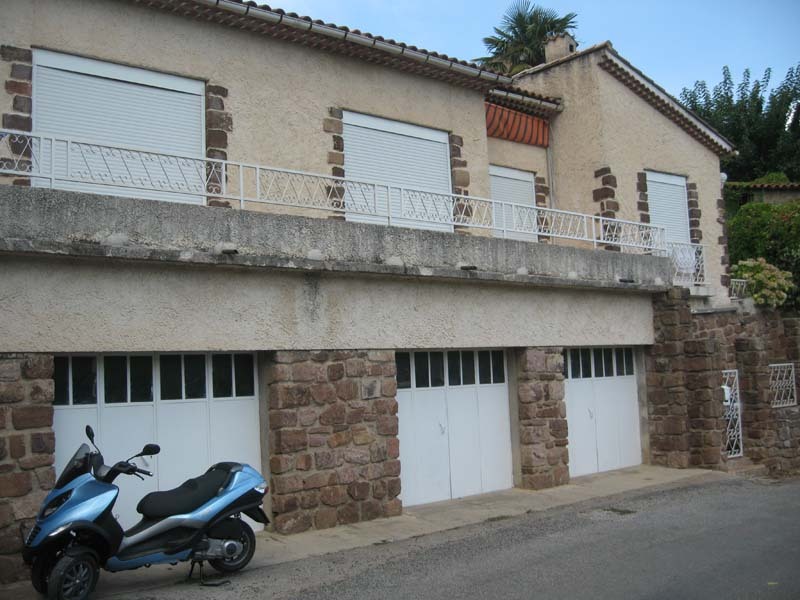 Our autumn trip this year was going to be a combined holiday and working trip as our son and family had moved to the South of France in July and we were keen to see them settled in their new home. With all new homes there is a degree of work needed to make things “homely” – this was to be no different. We set off as usual after breakfast with a very loaded camper as we had to carry things for the house, things for the kids birthdays and holidays including a play house, large peddle police car. Amazingly we were still under our maximum weight – well done Niesmann and Bischoff. We arrived at Folkstone and caught the evening train to Calais then driving down to Cleres for the night. 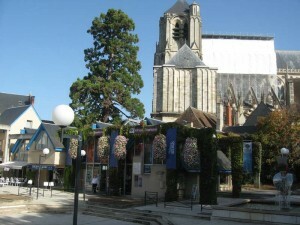 Cleres is a free Aire just north of Rouen that includes free services and free EHU. We continued on our way early the following morning and had a good run down to spend the next night at Saint Pourcain-sur-Sioule another super Aire on the banks of the Sioule that is a real credit to the town Marie and inhabitants. 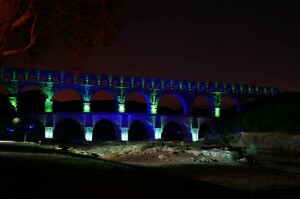 We have passed by the Pont du Gard several times but never actually visited it so this year we intended to look around. 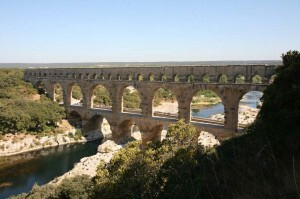 Our next night saw us parked in the Aire at Remoulins just a short distance from the Pont du Gard. 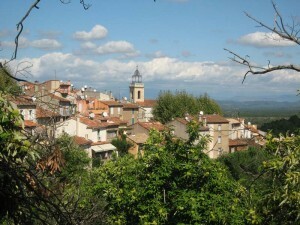 Remoulins town is not to be missed with its local market and typical streets and cafe’s. 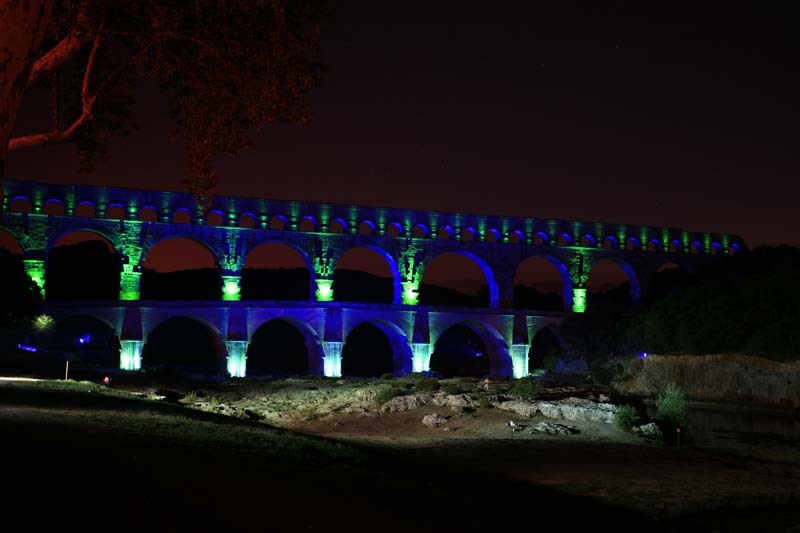 It is about a 2km and 30 mins walk to the Pont du Gard and we were really amazed to find so much to see. We spend all day looking around from top to bottom, spending time with lunch at the excellent hotel overlooking the Pont and river. Sadly the walk across the top of the bridge is now closed to the general public but you can walk across the lower road. 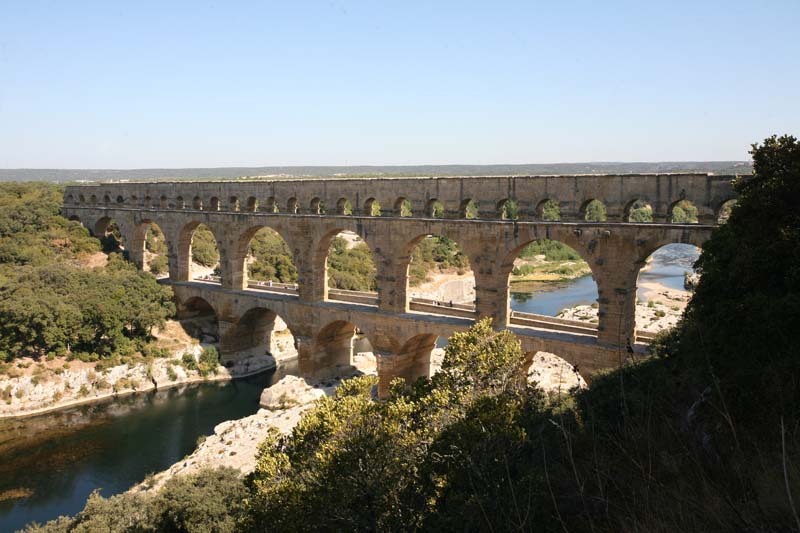 There is even a museum recording the building of the Roman aquaduct from the mountains in the west to Nimes in the East – a really fantastic feat of engineering. 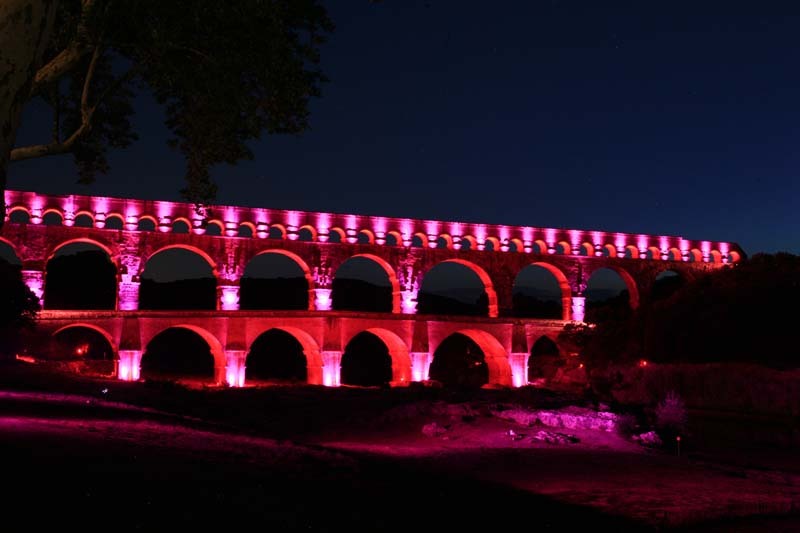 Our day was made when we discovered that there is a display at night to light up the bridge – this display is a must see and shows the bridge in a completely new light. After a couple of days we headed further south and found the nearest campsite to our family’s new home – Les Bruyers – just 3 miles south of Le Luc. We spent the next four weeks helping move furniture, making shelves, re-modelling the kitchen – all the usual stuff. This was enhanced by the abundance of chestnut trees outside their new house so each day we took the grand children to help pick a few chestnuts to roast on the BBQ. 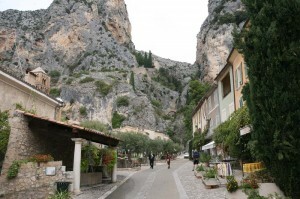 Les Mayons is a lovely village with some of the most friendly people we have met. They went out of their way to make everyone feel at home and encouraged their new residents to join in all the local festivities. It wasn’t all work and no play and we did take a few days out to visit the Verdon Gorge some 50 miles to the north. We made our base at St Croix du Verdon – a small village at the edge of the Lake. 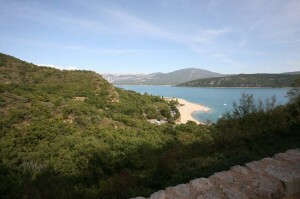 The Aire is high above on the cliffs with spectacular views across the lake. Sitting out having dinner with a glass of wine looking out at the mountains and water activities was something special. 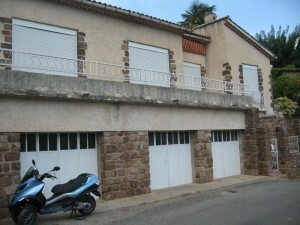 We decided to move to the far end of the lake to be near the exit to the gorge and stayed at the Aire in Moustier. 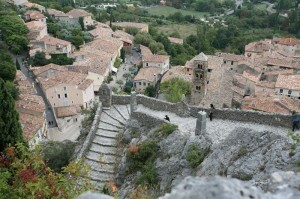 Moustier is a very old village with history going back to the Crusades. Indeed there is a star suspended between the mountains either side of the village that was originally hung there by a knight returning from one of the crusades. The village is really special and there is a very long and steep set of steps that take you up to the small church right up and nestling on the side of the path up through the mountain pass. The village square is well worth the visit. We used our bicycles and a trip on Peggy to explore the Gorge. There are also boats and pedalos to hire from near the Gorge exit. We didn’t indulge this trip as we had hired a boat on a previous trip a few years earlier. After a few days touring around we headed back to see if any of the shelves had fallen down, enjoy a BBQ or two with the family and collect a whole sack of chestnuts to take back to UK. We have wanted to visit Bourge for sometime now but it has always been “off route” so this time we made the detour and spent a couple of days exploring the old city. We have found over the past few years that one of the best ways to get your bearings and be able to maximise your time without wearing you out is to head straight for Le Pitite Train – the tourist trains that take you on a tour of the town to see at a glance all the hot spots on offer. 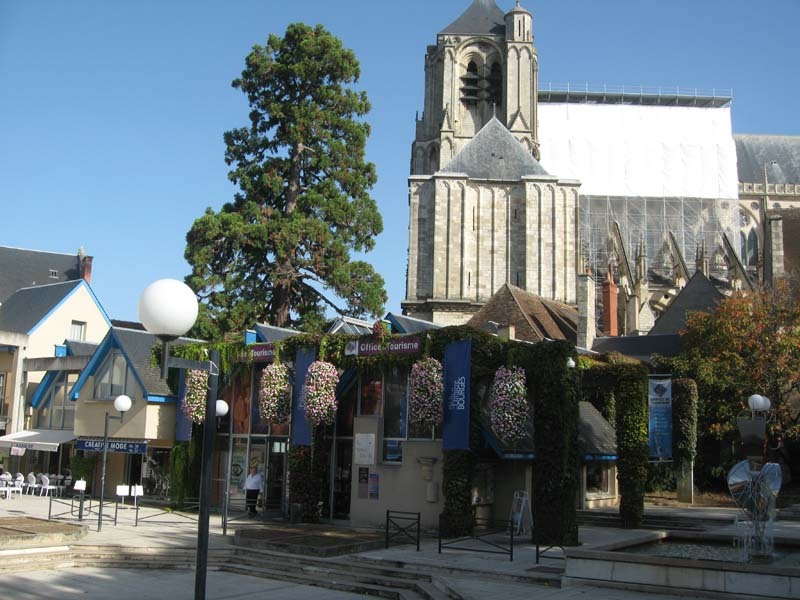 Bourges is no different and so we set off on the train and quickly decided which bits we wanted to further explore and those we could leave for another time. The Cathedral is a must of course but sadly the tower was closed due to repair work. The tower would be a grat oppurtunity to see out over the city and surrounding area. 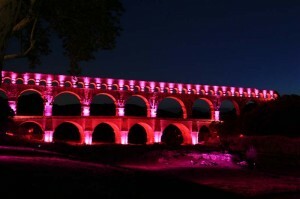 The old city walls and the military buildings are worth a visit and in summer the cathedral is lit up at night. After a couple of very pleasant days we set off yet again for Calais and home.